Check out this article we were featured in on ProRemodeler.com online magazine on Tile Leveling Clips. We where contacted by the writer and he asked us for some of our new technology-cool innovated products we may be using. We instantly thought of this unique product that we use on all of our large tile installs here at Ruepp Construction. Ruepp Construction Inc uses these Raimondi tile clips on all of our large format tile installations. These clips do a great job of keeping the tile level with each other. Tile that is uneven from tile to tile is called “lippage” and this helps prevent that. We have found that this works great with the new and very popular plank wooden tile look. Of course, no one likes the look of large grout lines with these plank tiles. 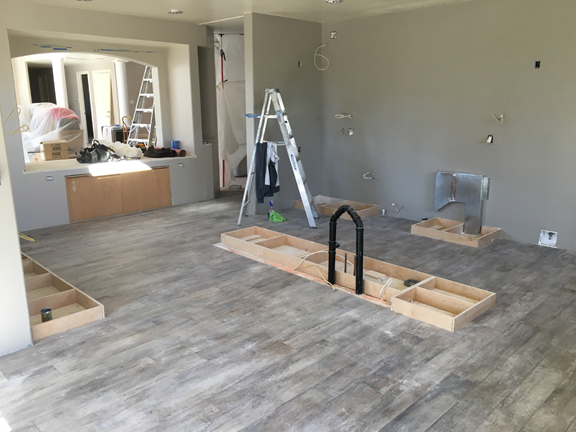 By using these clips they help us get these large format plank tiles to line up next to each other with as small as a 1/16″ grout joint. 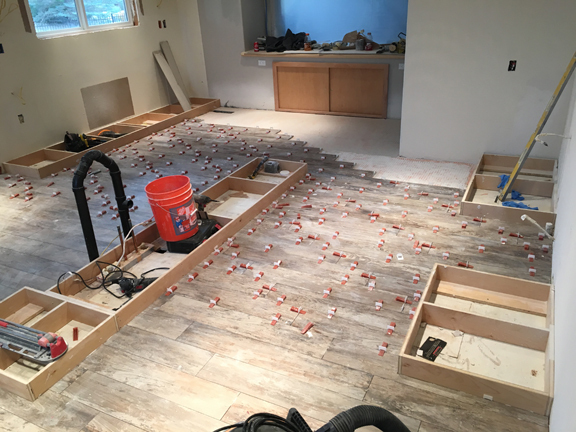 Here are some photos of a project we completed with plank tile that was 8″ x 40″ in size on a 1/3 offset pattern. This project came off fantastic looking as you can see the final product here. As you can see, the tiles are set very tight to each other. The grout lines are almost non-existent! 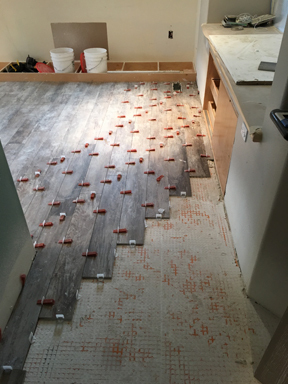 This tile is also set on Schulter Ditra underlayment which has a lot of benefits in itself. These are just some of the ways Ruepp Construction Inc offer’s a better product. These better products produce a better all around quality for your bathroom or kitchen remodel project. If you would like to talk to us about installing something similar on your project, please contact us and tell us about your project.